The Taliban have launched a new wave of violence against the Hazara people in Afghanistan. Namatullah Kadrie reports. THE TALIBAN HAVE killed hundreds of civilian fighters and have displaced thousands of others as they stormed in on Hazara-dominated districts in the past three weeks. On Monday morning, the Taliban announced a “total defeat” of the Malistan district of Ghazni province, one of three Hazara-dominated areas that have fallen to the Taliban’s hands. The Taliban – who are said to number at least 1,000 – began their multidirectional assault against the Hazaras, beginning with attacks on Khas district of Uruzgan province around three weeks ago, before apportioning resources to Jaghori district of Ghazni province. Elyas* arrived in Kabul on Monday, fleeing Malistan after hearing the Taliban were marching on toward their district. When asked about the number of people who had fled Malistan, he said, giving the Mir Ahmad clan of Malistan as an example, “the Mir Ahmad clan constitute of at least 85 khanwar (households). Almost everybody from this clan has left for Kabul". A civilian resistance fighter, Arif Rezaie, later said that at least two civilians from Malistan were wounded and were taken to Nawur. A Taliban spokesperson said in a statement that 11 commandos were killed along with 31 other fighters who most likely consisted of civilian fighters. Most of the villagers with their families fled Malistan toward Kabul using private transport. “Whereas before a Tonis (a minibus carrying about 10-12 people) used to cost 8,000 Afghani ($145 AUD) at maximum, people now pay 17,000 ($310),” Elyas said. * Elyas feared for his safety and security and requested that his full name not be used. As the Taliban announced on Monday that it had attacked Malistan, hundreds of protestors in Kabul took to the streets to clamour for more security support in Hazara-dominated areas of central Afghanistan. With the rallying cry “government, government, security, security", protestors, consisting mainly of students and activists, condemned the inadequate military support by the Afghan government and international community. However, the protest which began on Sunday night and carried into midday Monday, was soon terminated when an ISIS attack on the protest claimed the lives of six people, wounding 20 others. At least two protestors were among those killed. Arif Rezai, a civilian fighter who fought against the Taliban in Hotqol on Friday but fled to Bamiyan by Monday, said he saw “18 commandos and 20 civilian fighters” killed in the conflict. The same day, the Taliban boasted about having killed 22 commandos, and having cashed in “on sizable amounts of arms and equipment". Taliban spokesman, Zabiullah Mujahid, also said that no militant had been killed up until Monday. However, Mr Rezai disputed this. When I initially interviewed Mr Rezai last Friday, he said the Taliban took hostage “12 civilians” when they attacked Hotqol. Of those, “six elderly men were released whilst the younger men were kept as hostages". Among those killed was a notable Hazara General, Bashi Habibullah Jaghori, locally known as “Bashi Habib” who provided security to the Ghazni province. “Bashi Habib and three of his sons, Hayatullah, Bashir and Jawid were all killed,” Rezai said. Soon before Rezai fled, he said that at least 600 Taliban members had congregated at a checkpoint near Mado Qala. In a subsequent interview, Rezai said that 100 reinforcement commandos had landed in Sang-e Masha on Tuesday. 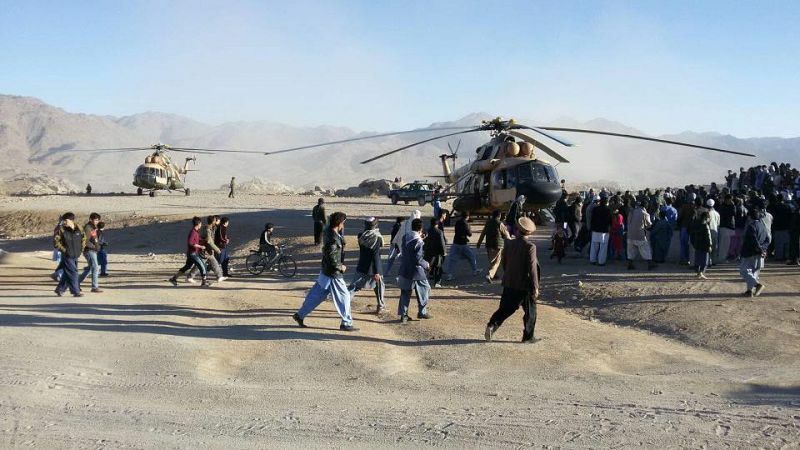 A resident of Baba, Nematullah Rafi said that six helicopters had arrived, of which four loaded the commandos and the remaining two carried their supplies and resources. Mr Rezai said he could not provide an exact figure of the total number of villagers who were displaced due to the attack. He said, however, that almost everywhere where fighting was going on in the Jaghori districts, most of the people had fled. The Taliban were quick to dismiss that there was any particular intention behind their assault on Hazara-dominated districts. They were however told to “support the Taliban,” to “denounce their allegiance to the Kabul Government” and “establish their footing in that region", Mr Rezai said. The recrudescence of attacks on the Hazara-dominated region has reawakened fears of massacres amongst the minority group. Many fear of attacks similar to the 1998 massacre which saw the extrajudicial killing of 2,000-5,000 Hazaras in Mazar-e Sharif. Although some have argued that the Taliban has shifted their political and religious motives since then, many Hazaras remain sceptical, especially given the joint attacks between Taliban and ISIS which targeted Hazaras. Namatullah Kadrie is a freelancer who mainly writes on issues related to immigration, refugees, and asylum seekers.